Emoji make the workday a little less boring. Humans are natural storytellers, so the moment you string two or more emoji together, people are going to try and work out what phrase/story/mood you are trying to convey. Using emoji in this way is basically building a puzzle out of pictures that people have to decode on the other end, and that’s a good thing! It can be the highlight in someone’s otherwise dull day. While the world continues to adopt a handful of languages for international business, Emoji quietly became the fastest growing international language understood by almost anyone on earth. It already took place before we realized it and perhaps it’s the solution to language barriers in the future. 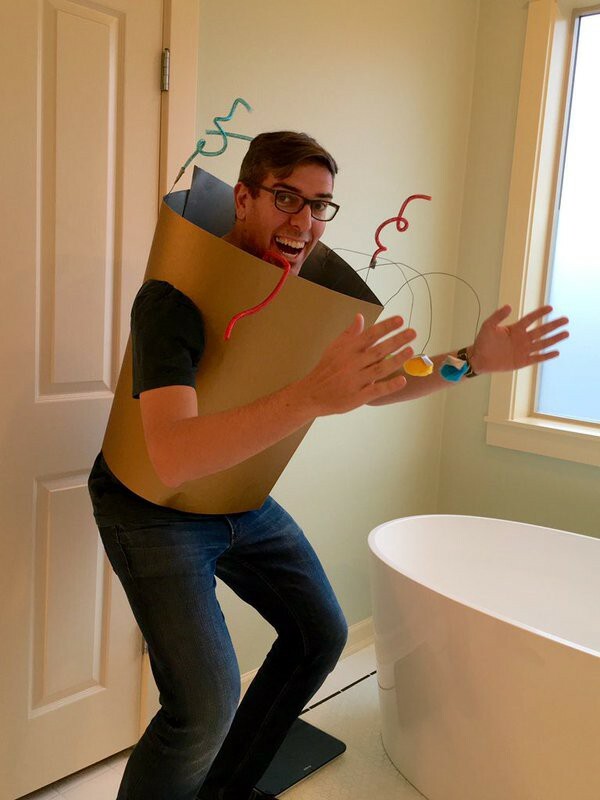 Bridge the gap between the virtual and physical by making an emoji Halloween costume. Ten minutes and $5 in office supplies and I became a 🎉 which is my favorite emoji. Anyone else can do this at your next office costume party. Next year I’m totally going as 💃. Matt Haughey enjoys long rides on the beach on bikes with ridiculously oversized tires.